In uncovering truths pertaining to the New World Order, it becomes necessary to study its power structure. This encapsulates a web-like base of operations that extends across the globe. Many people embrace these organizations because of the security that they profess to offer. This offer is almost always untrue. If the New World Order plans on a fascist World Super State, then there are primarily two areas of opposition: The United States and Western Europe. The reasons are many. First, we are the predominant economic generators. Because of this, we have the luxury time to pursue our freedom. If we were starving in the streets, which some economists are speculating will happen, we would not be able to spend two hours a day surfing the net to find out every misdeed against us. Second, and more importantly, we have tasted the sweet Fruit of Freedom. This fact makes us more vehemently opposed to totalitarianism. Those who have never known freedom, know not what they are missing. As Westerners, as evil as they say we are, we know freedom and it’s precepts. Of course, with the last one hundred years of incremental imprisonment, many Westerners are now unaware of True Freedom. We are fortunate in that, even in the current state of oncoming oppressiveness, we are aware of the meaning of individual sovereignty. This knowledge encompasses the benefits, privileges, and responsibilities of freedom. The fortune that we were born free also makes it our duty to study the power structure of our respective countries, and the world. 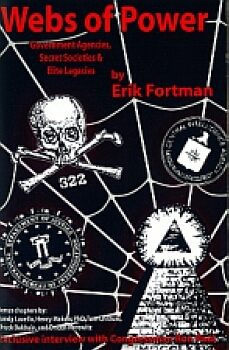 In my series, “Webs of Power”, this author attempts to write a simple, basic overview of America’s ruling entities. It is my hope that these articles will provide even a few pieces of data and other insights into the organizations that run our life. The Federal Reserve is the entity that oversees and regulates America’s money supply. This system was instituted by Congress in 1913. There are seven members on the Board of Governors, and twelve Reserve Banks located in America. The Board of Governors are appointed by the President and confirmed by the Senate. The official Fed website states, “The primary responsibility of the Board is formulation of monetary policy.” However, “the seven-member Board represent a majority of the twelve-member Federal Open Market Committee, the group that makes the key decisions affecting the cost and availability of money and credit in the economy.” It seems that these are not appointed by our elected leaders, but by officers of the Bank. Many of the board’s members are also involved in other organizations. For example, the New York branch’s president, William J. McDonough is a member of the Council on Foreign Relations and is a member of the Trilateral Commission. Both of these organizations advocate the New World Order. Those interested in learning the actual intent and purposes of the Federal Reserve would be well served to read the book “Mullins on the Federal Reserve”. Eustace Mullins served in WWII and was educated at several American and overseas Universities. The book was commissioned by Ezra Pound, a great American poet and writer who was held without trial as a political prisoner for thirteen years due to his criticisms of the Fed and his opposition to entering WWII. Dr. Pound was indicted by F.D. Roosevelt at the orders of Alger Hiss, both of whom were later discovered to have many Communist connections. Pound guided Mullins in the writing. No American publishing house initially accepted the book, and 10,000 copies were burned in Germany, which was approved by James B. Conant, then President of Harvard University. Eustace Mullins now enjoys full circulation of his book, which he researched and updated almost continuously for 50 years. Mullins, in his exhaustive research, has come to the conclusion the Federal Reserve “is not Federal; it has no reserves; and it is not a system at all, but rather, a criminal syndicate.” These are harsh words against the entity that runs all of the United States’ monetary and credit policy. The Federal Reserve is the organization that American taxpayers pay debt to, both personal debt and the American deficit. The Fed has always been cloaked in secrecy, from the first meetings by International bankers at the turn of the 19th century on Jekyll Island, Georgia. The Federal Reserve Bank of America is not a government entity. It is a private corporation with stock owned by shareholders. A majority of these shareholders are not American. The prior paragraph is common knowledge by economists and professors, and can easily be found with minimal research. With that knowledge, I will record a list of assaults against our Country implemented by the Federal Reserve and their Elitist directors. According to Mullins, the Fed is responsible for America entering WWI, the agricultural depression of the ‘20’s, the Black Friday Crash of Wall Street in 1929, the Great Depression, WWII, the conversion of American’s assets from real property to paper assets in 1945 which has caused America to go from the most prosperous nation in 1945 to the largest debtor nation since 1990. Knowing this, might it also be possible - nay, probable - that the Fed was also instrumental in the decision to go to war with Iraq? For many years, America was run on a debt-free money system. I have read that the American Revolution was not fought over taxation so much as it was a war over this monetary system. England wanted us to use their banks, and thus accrue debt and pay interest. Americans had been printing Colonial Script money, which was debt-free. Our first Congress was divided on this issue, and the War for the Fed was waged and finally won in 1913. President Thomas Jefferson was a vicious and vocal opponent against this Federal Reserve System, and it would be prudent to quote his writings at this juncture pertaining to the Federal Reserve Bank. Jefferson said that the institution of a central bank was undertaken for these, among other, reasons. 2. To enable them to receive grants of land; and so far is against the laws of mort main. 3. To make alien subscribers capable of holding lands; and so far is against the law of alienage. 4. To transmit these lands…to a certain line of successors; and so far, changes the courses of descents. …7. To give them the sole and exclusive right of banking, under the national authority; and so far is against the law of monopoly. 8. To communicate to them a power to make laws, paramount to the laws of the states. Presently, there are many hints and rumors of hints about the Fed. William J. McDonough, the Governor of the New York branch, is due to be replaced soon. In the Inner City Press, it is stated that so far, all appointments have been declined. If no one accepts the position, the first vice president, Jamie B Stewart Jr. will receive the post and is not granting interviews. Mr. Stewart was formerly a vice president of the Mellon Bank Corporation, with the Mellon‘s being affiliated with the Rockefellers and the Rothchilds. The Inner City Press continues, “we were informed last week by the Federal Reserve Bank of Boston that ‘you should be aware that the Federal Reserve Bank is not an agency of the federal government and is not subject to the Freedom of Information Act…” This great website also quotes William Ryback, associate director of the Fed’s BS&R division as saying that they have detected a lack inside the Fed in enforcing the anti-money-laundering laws. On the current deflation worries, Greg McBride, CFA eludes in his column to the fact that the Fed is NOT worried about deflation, but wants to create an environment for long-term low interest rates to encourage mortgage refinancing and corporate borrowing. This would cause more money to be owed to the Federal Reserve, therefore boosting their privately held shares. Another very interesting story is that of Navy Captain Gunther Russbacher, in his article “The Short Road to Chaos and Destruction: An Expose of the Federal Reserve Banking System.” In the editors note, we a privy to a short bio on Russbacher. He served three decades as a Naval Intelligence Officer and covert operative. “In 1980 Captain Russbacher flew then Vice President George Bush to a secret meeting in Paris in what has become know as “The October Sunrise Scandal.”” In 1989, Russbacher was to marry a reporter researching the scandal. He was told not to wed her, and when he did was immediately arrested and incarcerated until December, 1993. He was a political prisoner during Bush I’s administration. In these writings, Russbacher asserts that 300 families rule the world. It seems information was leaked to Russbacher about the then new American currency which caused him to begin to study the Fed. (Russbacher states that Congressman Ron Paul was also asking questions about the new printings.) Russbacher further claims that several countries at the time were planning new currency. These currencies have several similarities, including a filament strip that is detectable at airports. “Rumor had it that these currencies would later receive a common image linking them together in an international monetary system.” He also wrote from his prison cell, that “the chance of bypassing the new currencies and going directly to an electronic (cashless) system are increasingly exponential.” There is so much more in Captain Russbacher’s essay, and I recommend it highly to all. In closing, it is easy for anyone with the remotest computer ability to log onto the web and discover the corrupt, corporate, secret workings of the Federal Reserve Bank. It’s shares are held by private, mostly foreign owners whose interests lay in a different reality than our own. Almost every modern secret societies is behind the scenes of the inner sanctum, including the CFR, Trilateral Commission, and the Bildebergs. There are rumblings among prominent governmental and academic personnel that the Fed is planning to depress the United States monetary system to a point of no return. This design correlates with the implementation of the Eurodollar, which these foreign bankers would be better served to have as the leading currency on Earth. As an author, a political critic, and as an American, I beseech each and everyone reading this to write every one of their political representatives to rid our society from the scourge of the Federal Reserve.